Last weekend, I saw several pieces of performance art. It got me thinking about how to think about performance art. How is a particular kind of performance art different from another? This is a framework I created over the weekend to help me think about it. The first thing that got me thinking was Jorge Galvan's sculpture/performance El Dinersito at Pan y Circos, the show I curated with Zoya Tommy. The performance part was that Galvan made tacos for the opening night attendees. This seems typical of that subcategory of performance art called relational art, of whom Rirkrit Tiravanijia is the most prominent practitioner. But I also recalled sitting at the bar at Notsuoh and being told by Jim Pirtle that he considered his bar/live music venue to be a piece of "social sculpture." The term was created by Joseph Beuys and it was broader than just performance, but included a lot of performance. Gordon Matta-Clark's restaurant Food seems to fall into this broad category. Likewise, the artistic practices lumped into the category of social practice seem closely related. So these all became one of the circles in my Venn diagram. Also this weekend, I saw a solo performance by Nancy Douthey (about which more in a subsequent post). Her performance was completely different--categorically different--from Jorge Galvan's. It was more of a theater piece--she wore a costume and took on a persona (or personas, really), and spoke lines. I don't know if the lines were written in advance or if they were improvised, but what I saw was fundamentally acting. And this seems to be a big part of performance. 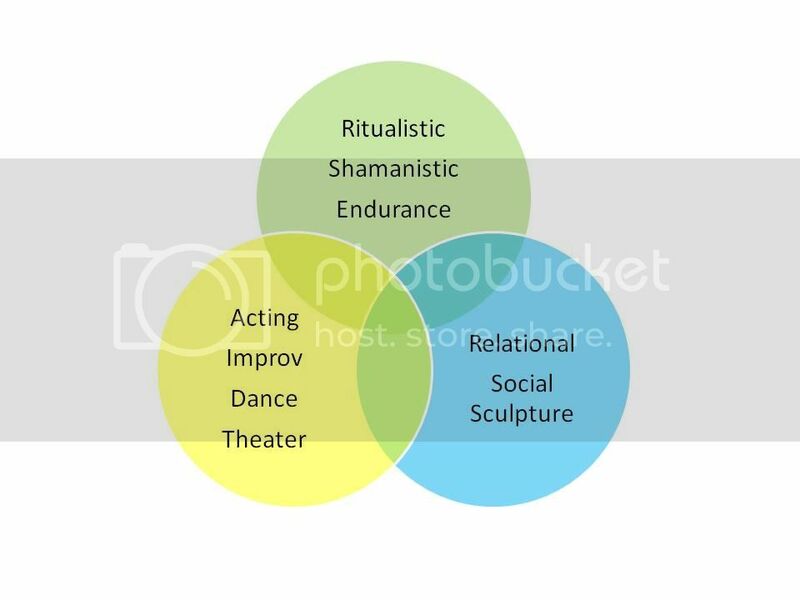 And to put it more broadly, there seems to be a big and important strain of performance art that has evolved from traditional stage arts--theater, dance, stand-up, etc. But all performance doesn't fit into those two categories. When Marina Abramovič and Ulay slapped each other in the face over and over (Light/Dark, 1977), when Chris Burden had himself nailed to a VW Bug, when Tehching Hsieh punched a time clock every hour on the hour for an entire year (Time Clock Piece, 1980-81), they were neither "acting" nor were they particularly "relating". These pieces involved endurance. The prehistory of these pieces could be found in shamanic practices, in the extremities that yogis undergo, in the various deprivations and self-scourging of medieval holy men. In many of these pieces, there is a spiritual aspect--extreme repetition is like reciting a mantra, for example. But not all endurance pieces are spiritual--the Art Guys sitting in a Denny's drinking coffee for 24 hours, for example. And not all ritualistic pieces are about endurance--Judy Chicago's atmospheres, for example. But broadly speaking, I think we can group endurance pieces and ritualistic pieces together. But, you ask, aren't these categories kind of fuzzy? Can't a piece fall into any two of the above categories, or even all three of them? Sure--that's why I depict it as a Venn diagram. The Art Guys sitting in Denny's was an endurance piece, but it was also a relational piece. Endurance pieces can also be theatrical--there is a whole tradition of this in the circus and in acrobatic performances. I'm sure for those of you who have really studied performance theory and practice, this will seem a bit simplistic. But it's just a framework--a way to think about what I'm seeing. I would also suggest a "Get Naked/Schlap and Tickle" addition to the Venn diagram.